Malpractice risk according to Physician specialty is variable. Certain specialty has a higher risk compared to others. 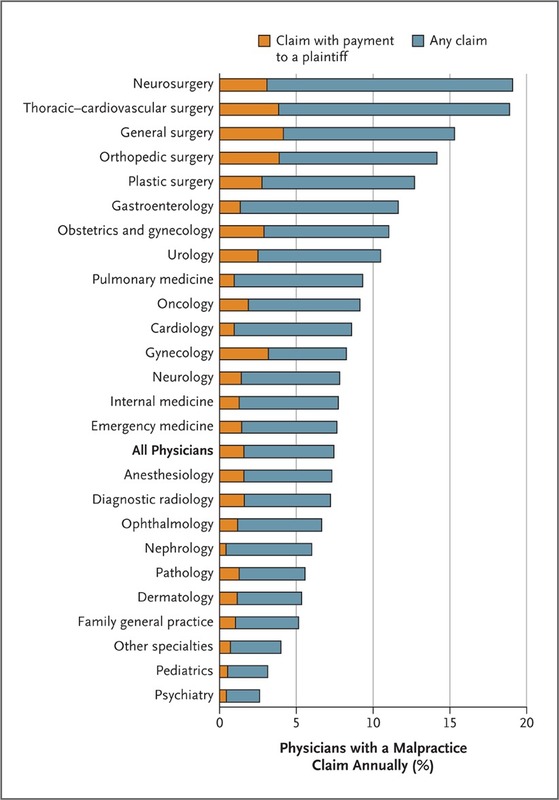 Data are limited on the number of Physicians who face malpractice claims, the exact size of the claims and the cumulative career malpractice risk associated with each specialty. Based on a pretty large volume of insurers from a large professional liability insurer in the United States with a nationwide client base of over 40000 physicians and over 230000 physician-years of coverage for 25 different specialty- a report was created informing the proportion of physicians who had malpractice claims every year. There are specialties which fall in high risk and low-risk categories. About 7.5% had malpractice claims. Only 1.5% having claim lead to payment of compensation. The mean indemnity payment was 275000 USD. and the median was 111000 USD. By the age of 65, 75% of low-risk specialty Physicians had faced a malpractice claim at some stage of practice and 99% of high-risk specialty Physicians had faced a malpractice claim. In conclusion, the cumulative risk of facing a malpractice claim is high in all specialties although most claims do not lead to Payments. To schedule an Air Ambulance Flight - Call us or Email us.